For a quarter of a century international diplomacy has been dominated by the concept of the cold war as it crystallized under Stalin and Dulles. Mankind was seen as split into two camps to use Zhdanov’s phrase – led by the Soviet Union and the United States, and inspired by totally incompatible visions of world order. Sooner or later every country would have to join one camp or the other. The West believed that the communist camp would use force to expand its frontiers unless faced by superior power and the manifest will to use it. The communists believed that the West would resort to war when faced by its inevitable defeat at the hands of international revolution. This picture of the world is still an element in the approach of communist governments. It has also shown an impressive capacity to survive the West. 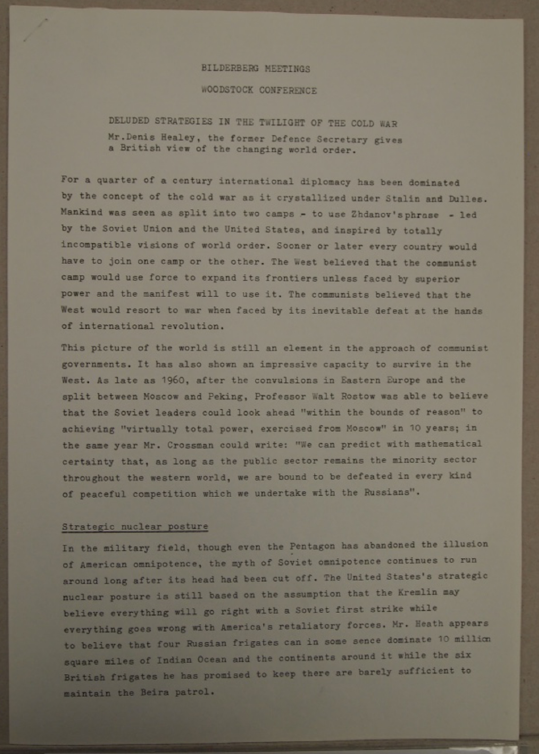 As late as 1960, after the convulsions in Eastern Europe and the split between Moscow and Peking, Professor Walt Rostow was able to believe that the Soviet leaders could look ahead “within the bounds of reason” to achieving “virtually total power, exercised from Moscow” in 10 years; in the same year Mr. Crossman could write: “We can predict with mathematical certainty that, as long as the public sector remains the minority sector throughout the western world, we are bound to be defeated in every kind or peaceful competition which we undertake with the Russians”.